All Razertip Pens are unconditionally guaranteed for 1 year. All tips are unconditionally guaranteed for 90 days. Razertip's standard pens are the smallest, most versatile pens made. Their fixed-tip heavy-duty pens are a bit bigger, but they will take punishment like no other. The #BPH Interchangeable-tip HD pen allows you to buy those "lesser-used" tips, or to make your own custom tips. All Razertip pens carry a full one year unconditional warranty (including fixed tips). Adapter cords are available to fit Razertip pens for use on other burners. With a larger pen body than the standard pens, HD pens are built for maximum durability. They have heavier connector posts and heavier tips. 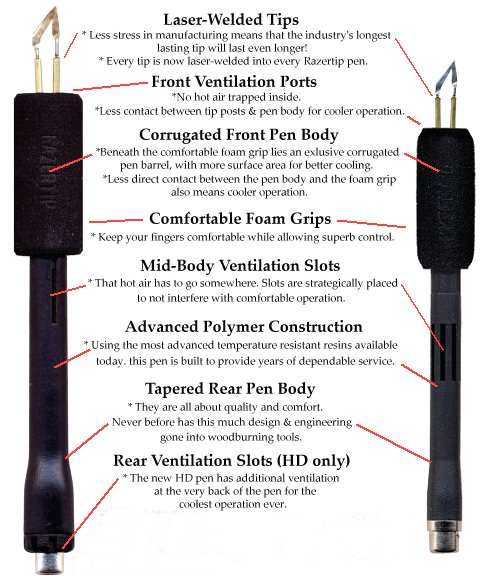 HD pens require a higher heat setting than most standard pens and are best used with a heavy-duty (HD) cord. While still capable of very fine detail, they are ideal for applications where the flat side of the tip is used (shading, quill-making, etc.) or in schools or clubs where inexperienced users can be hard on equipment. They are also prefered for burning/carving applications and when pushing hard to burn heavy texture. The Binding-post Interchangeable-tip Pen is the most versatile pen available. Great for those who want to make their own tips or for those rarely used but still important tips. Versatile: Make your own tips from almost any heating wire! Accepts almost any thickness of tip wire from 16-22 ga. as well as most Razertip® tips. You can even mount two tips in the head at the same time for double-line burning (HD cord recommended; higher heat setting required). Dependable: Stainless-steel binding-post screws hold your tip wire securely against a double-slotted stainless-steel nut that is easily tightened with a small slot screwdriver. The screw can be removed to facilitate cleaning when necessary. Comfortable: The binding-post screws and nuts on this pen act as an effective heatsink, slowing the transfer of heat from the tip into the pen body. The BPH is one of the coolest operating pens made today. Note: Tips made from wire over approx. 2.5" long will not get hot enough to scorch wood. For best results, keep your custom tips at 1.5" or less. Laser-welded tips Less stress in manufacturing means that the industry's longest lasting tips will now last even longer! Every tip is now laser-welded into every Razertip pen. Mid-Body Ventilation Slots That hot air has to go somewhere. Slots are strategically placed not to interfere with comfortable operation. Corrugated Front Pen Body Beneath the comfortable foam grip lies the exclusive corrugated pen barrel, with more surface area for better cooling. Less direct contact between the pen body and the foam grip also means cooler operation. Comfortable Foam Grips Keeps your fingers comfortable while allowing for superb control. Advanced Polymer Construction Using the most advanced temperature resistant resins available today, this pen is built to provide years of dependable service. Tapered Rear Pen Body They are all about quality and comfort. Rear Ventilation Slots (HD only) The new HD pen has additional ventilation at the very back of the pen for the coolest operation ever! What's the difference between Fixed and Interchangeable Tips? What tips do you recommend for beginners? Can you explain the 3 basic tip principle? How do I know what tips to choose? Can you advise me about what tips to buy? Have you personally tested all of these tips? What is the 'burning profile' and how did you test it? Do you use a Razertip Burner? Can Razertip replace broken or unwanted tips on Fixed Tip Pens? Can you get me a Razertip tip that you don't have showing on your sales pages? What's the difference between a spoon shaped or curved base shader compared to a flat base shader? Why do you prefer a curved base shader? My BPH Pen makes a buzzing sound and the nib doesn't heat properly. What's wrong? Why is your Razertip equipment so inexpensive compared to others? Can you tell me all about Razertip Package Deals?